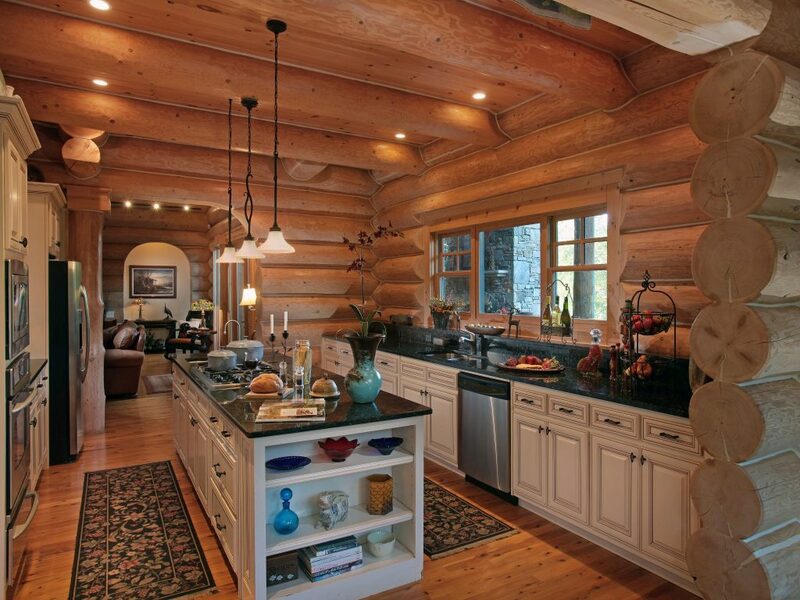 What kitchen style will you choose for your new log home? 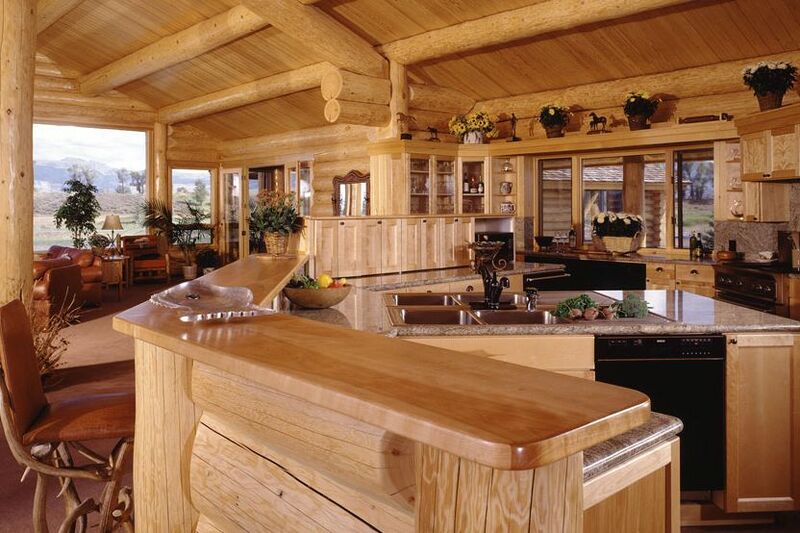 Few things will affect the finishing costs, overall style and value of your log home more than your kitchen. It’s the hub of family life and the core of preparation for entertaining friends. Its flow and function are vital to successful mingling in your daily routine and on social occasions. 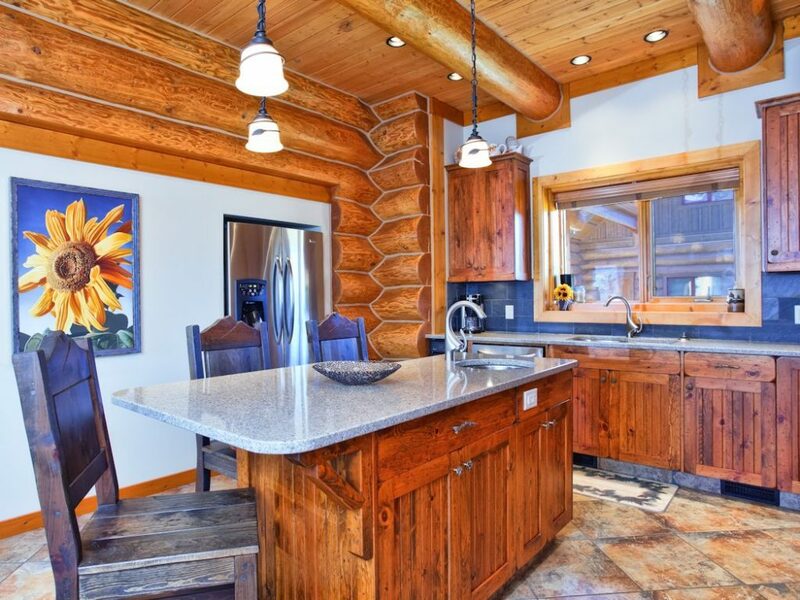 Your kitchen is often one of your biggest investments in the completion of your log home and one of the most important style decisions you’ll make. The choice of cabinetry sets the tone for your entire house, especially with “open-concept” design. For many years it was assumed that a log home owner’s love of natural wood tones obviously extended to everything in the home. Since this creates a cozy space with lots of old-fashioned charm, it became the common choice for log home kitchens although it was only one of many options. As interior decor styles evolved, log cabin kitchens were often predictably similar. 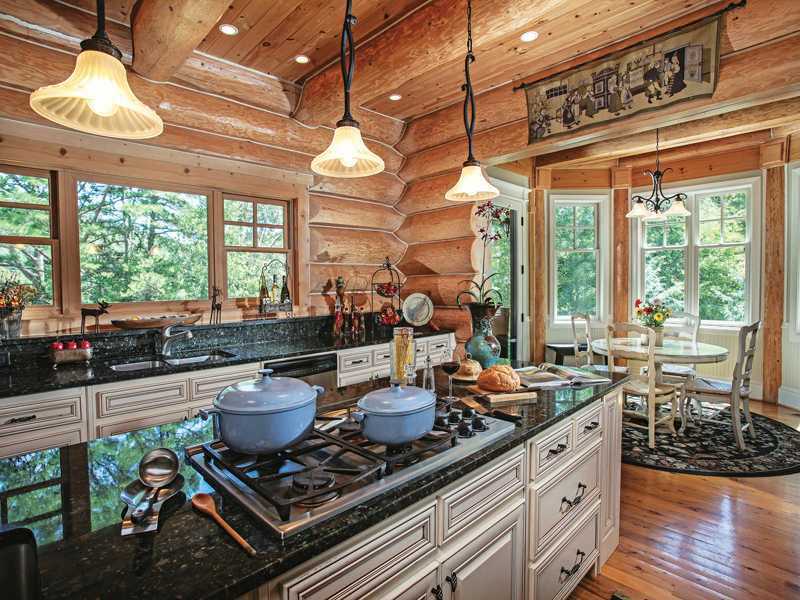 People who love log homes frequently value traditions and recognize fads as transient phases. With the rich history behind the log cabin it was common to stick with country, western, or pioneer themes. Not until more recently have log home owners integrated more luxurious finishing choices and an endless variety of cabinetry options. Phrases like “rustic elegance” began to crop up. Confidently mixing and matching country charm, period pieces and modern elements, the log home kitchen showcases the personality of the contemporary log home owner. 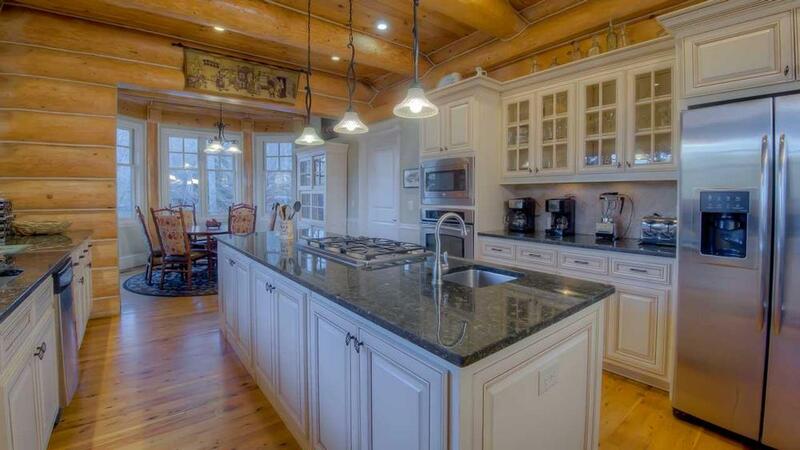 While styles change over the years, a log home kitchen remains the heart of the home! 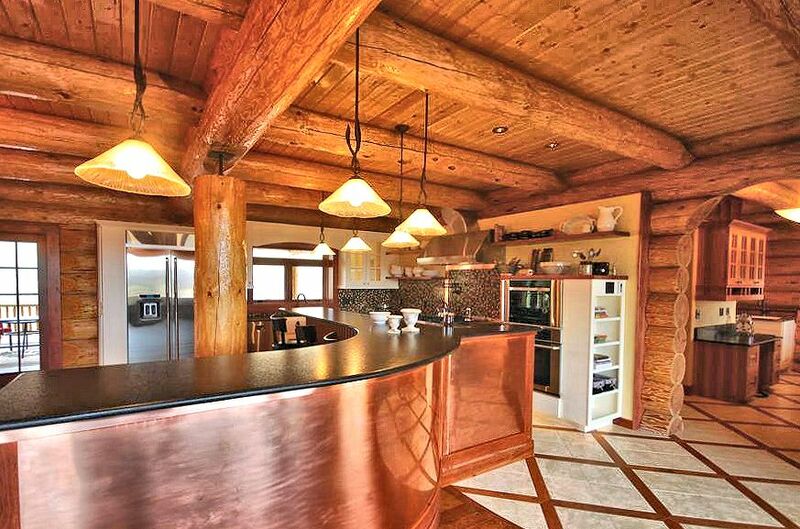 Copper and white accent Douglas Fir Logs in the welcoming kitchen of a Montana log house built in 2010. Around the corner is a functional “butler’s pantry” capable of handling the preparation of large meals for hungry ranch hands. While many log home enthusiasts continue to cherish the original country lodge look with its beloved antler accents, it does limit the common perception of a log home interior. The natural log cabin style in a log home kitchen is classic, but blending modern and rustic elements catches the attention of a wider audience. Occasionally a flat wall surface is desired in the kitchen area. If so, a frame wall can be attached to the log walls (with settlement anchors) as demonstrated in this lake home from 2007. Fresh white cabinets and stainless appliances brighten a country kitchen by increasing the amount of reflected light. Planning the “Heart of the Home” Not just a woman’s task anymore, men know what they want in the kitchen! The “Transitional” and “Eclectic” design habits today encourages home owners to pick and choose what they like rather than stick to a certain style. Designers suggest that husband and wife teams collect ideas on Pinterest in order to understand the personal taste of each and come up with custom blends that feel like home! 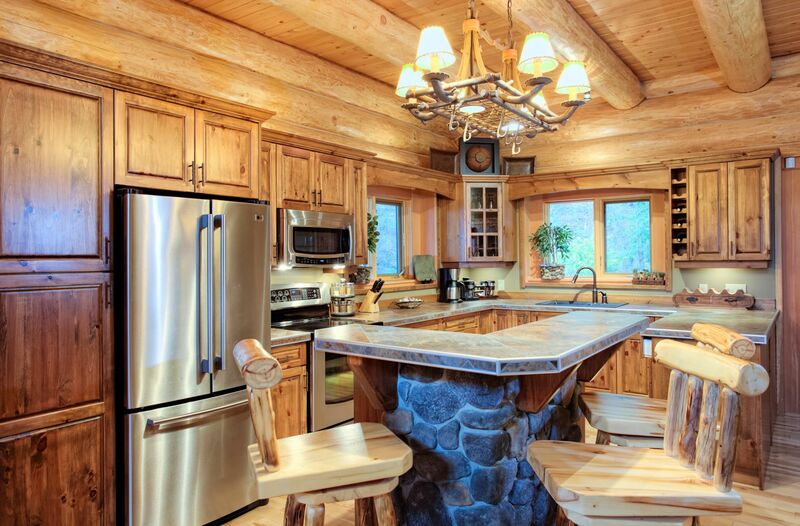 The log home kitchen in a California family home from 2010 pairs sleek modern appliances with rustic counter stools. From the campy flavour of a cabin kitchen, through rugged rustic creations featuring rough stone and raw edges, right up to crisp white and gleaming stainless, anything is possible in a log home kitchen. Rich and dark or bright and light, there have never been more kitchen options to choose from. Finding a functional style that you’ll enjoy for many years ensures you’ll be satisfied with your decision. 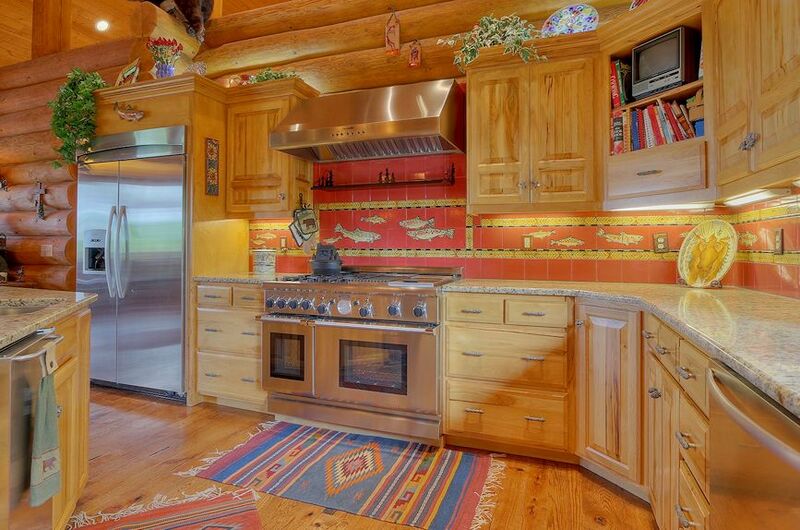 Below you’ll find a few log cabin kitchens lived in and loved by regular folks. After a few decades a handcrafted log home is still young, but older decor and cabinetry can date even a premium quality log house. Note the different kitchens and consider how your preferences will stand the test of time. 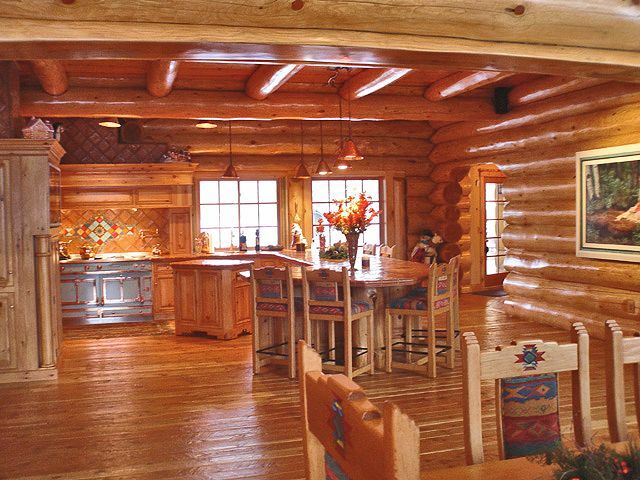 Light natural log walls and matching wood cabinetry in a Wyoming home built during the 1990s. 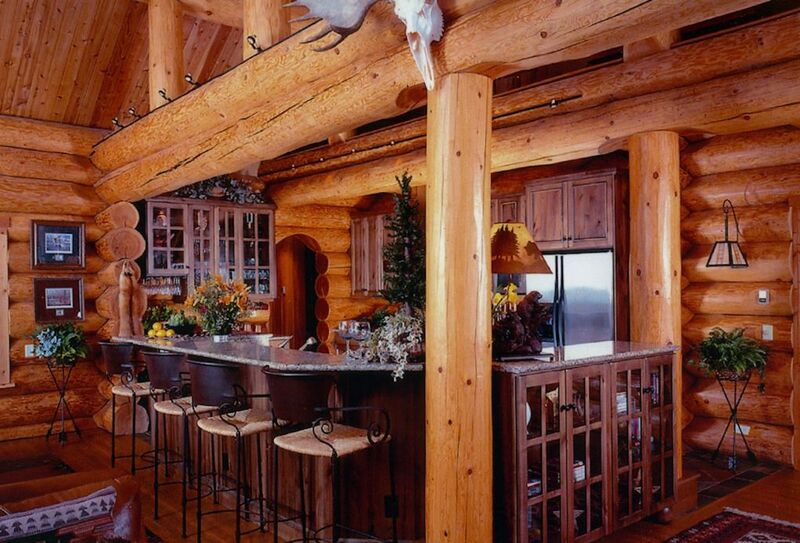 The kitchen, like the rest of the decor in this 2003 custom Log Post and Beam home, is deliberately rough around the edges. Rock from the property was used throughout the home. A country western kitchen shows a love of color and tradition without skimping on modern conveniences! 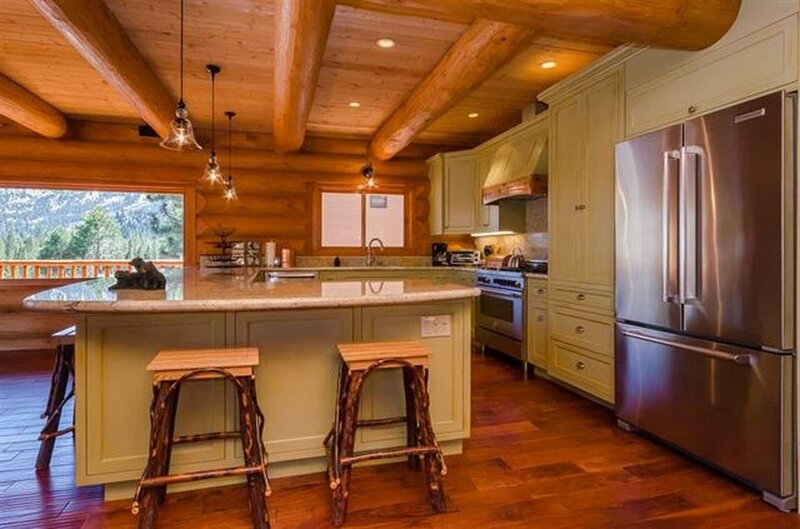 The owner’s favourite part of this log home kitchen from around 2000 is the baby blue stove…maybe because she heard Brad Pitt recently bought the same one! Refined but rugged. 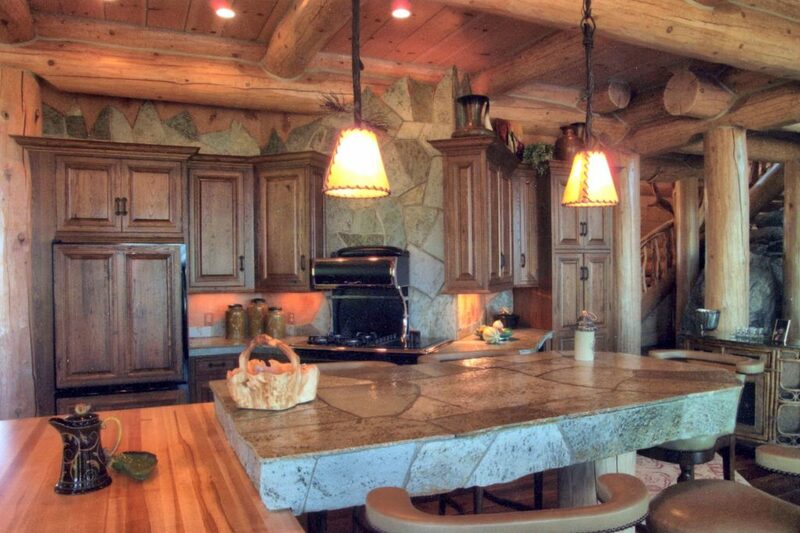 A partnership of strength and style with polished and rustic features makes a unique bar kitchen from a 2005 mountain home. 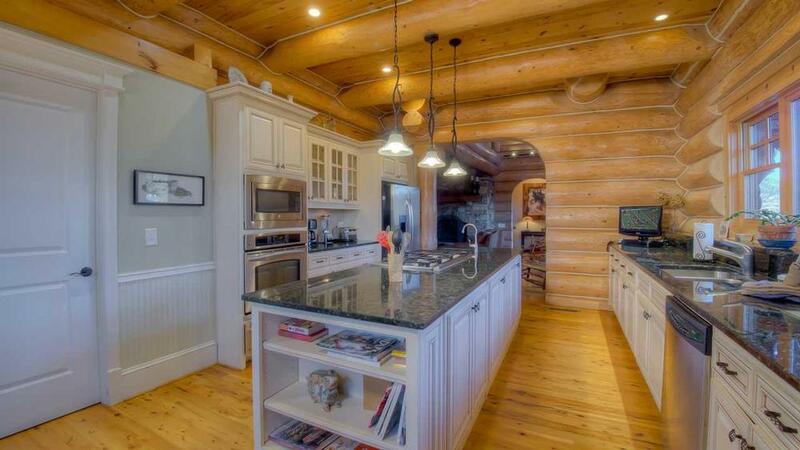 Bright and white, this modern traditional kitchen dispels a lot of myths about log homes. So when it comes down to answering the question, “What kind of kitchen should you get for your new log home?” The answer is simple: whatever feels like home for you and your family!